United Air Lines’ Honolulu service was initiated on May 1, 1947. That year, the average passengers carried on this route (total of both directions) was 2,100 per month. In 1964, the monthly average was 33,100. 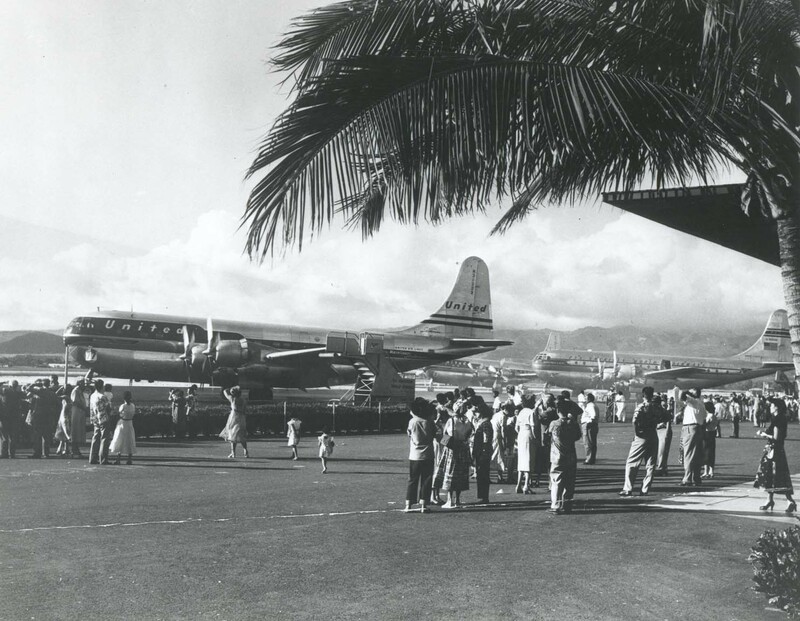 For the period May 1, 1947, through August 31, 1964, 1,917,749 passengers were carried on the Honolulu route alone. The cargo-carried monthly average (also total of both directions) went from 36,500 pounds in 1947 to 787,000 in 1964, totaling for the period May 1, 1947, through July 31, 1964, a total of 45,985,000 pounds. 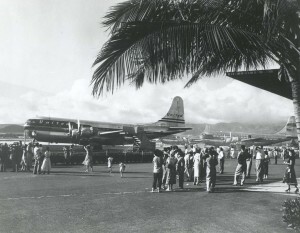 When United Air Lines inaugurated Stratocruiser service from Hawaii to the mainland in 1950, Honolulu was linked directly with 87 mainland cities. In November, 1964, UAL installed in-flight movies for ocean-overflying passengers. 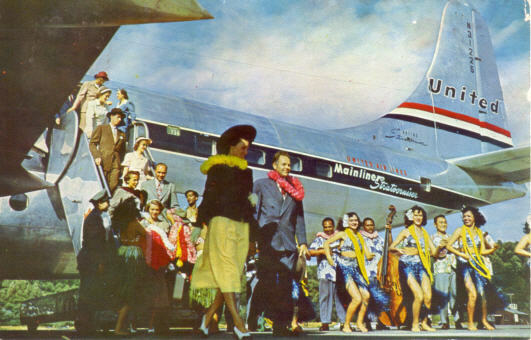 From the mid-1960s through 2006, United expanded its Hawaii service with larger aircraft, with flights to the outlying islands and with daily service to Honolulu from Osaka and Tokyo. In the 1960s, United was operating DC-8s to Hawaii and was continuing to set industry records for the longest flights in the United States. On August 1, 1969 United launched nonstop Chicago-Honolulu service with a DC8-62 aircraft, and on October 1, 1969 inaugurated its nonstop 4,979-mile New York-Honolulu service–the longest U.S. domestic route at the time. United Air at HNLDuring the 1970s, United began flying larger aircraft to Hawaii, including Boeing 747-100s and DC-8-71s. 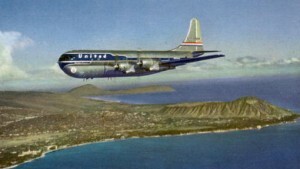 In the early 1980s, United brought in DC-10s, and began launching nonstop flights from the mainland to Maui, Hilo on the Big Island and Lihue. Boeing 757, 767-300 and 777 aircraft eventually joined its Hawaii service. And in 2000, United initiated the industry’s first Boeing 777 service between the U.S. mainland and Hawaii, with nonstop service between San Francisco and Maui. By continually increasing the size of aircraft on its Pacific routes, United was able to boost passenger numbers. In 2005, United flew 1.7 million passengers and 99 million tons of cargo to the Pacific state. By 2006, its 59th year of service to Hawaii, United was flying there nonstop from six U.S. Mainland cities, including San Diego, Seattle, San Francisco, Los Angeles, Denver and Chicago.